DID YOU KNOW? AN AVERAGE FOUR-YEAR OLD CHILD ASKS 437 QUEST - ProudMummy.com the Web's Community for Mums. DID YOU KNOW? 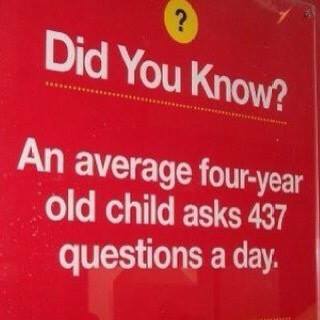 AN AVERAGE FOUR-YEAR OLD CHILD ASKS 437 QUESTIONS A DAY. I am pretty sure my son has doubled that by breakfast lol 😂😂😂 got to love it you reach the teenage years and your lucky to get a grunt although I do often get from my 14 year old shouting from the bedroom "why is our Wi-Fi so rubbish" and "I'm starving is dinner done"
Yeah and 434 of those are the same question "why"? Yes as it happens I am more than aware of that fact. Linda Wright-Coyle now quadruple that and times that by a hundred and that's the actual amount! Less than a week to go!! Hahaha Mark Lawrie why? Why? Why? I actually think that's true of someone I can think of!!! Lucy Darling!!! My daughter smashes that out by breakfast. Yes I bloody do know thanks! And a 10 yr old asks double that!!! And 401 of those is, Why? Im sure that doubles once your 4year old starts school! Linda Burton surely Louis was at least double that today!? Sign of intelligence, when u answer they process and remember! In my sons case it’s usually the same bloody question over and over and over again mummm please can me have a biscuit?? Surely that is 'per hour' not per day! Pretty sure my 2 yr old hits that now! Mallory. Bahahahahaha. What you have to look forward to. Is that all?! Mine does that in like an hour! It’s amazing we manage to teach at all Suzanne Reynolds! Anna Price nanny wait? Mommy why? Mommy bus? Mommy train? Mommy bock? Mommy juice? Mommy sweetie? Mommy Mommy Mommy Mommy!!! Robyn Brassington. . . . . Alfie can easily double that lol! Tommy Evans we know this all too well! Karen Karen Louisa Barwell I am sure she asks more than that! Ryan Corrigan Kathy Peter Jack - can I ask you a question !!! Brenda King who does this remind you of?? Paul Evenden if we relate that to Owen Evenden at that age do you think that is more? I think 3 years olds do too Holly Weller! Rebecca Dennison Scott Dennison Jaggar is definitely not average, so about 1542 then?? Rosie Cornell.no wonder u get headaches. Jason Cannon Ball Amelia asks double that!!! Heather Maxwell do u know a little one like this? Robert Hunter this is so so true. 430 of them are why? So can a three year old! Even more why’s - oh oh!!! My life story right now! Paul Huddle Charlotte Beton Lily Beton Amelia asks about quadruple that by breakfast! Becky Davies Madison’s asked more!! Danielle Quinn Ruairi McDermott Id say Caitlin asks double that in a day! Is that true Catrin Page. Nicole Moon Justine Moon sounds about right!!! John Walker Lisa Allman Carol Deacon bet it seems like more!!! Is this true Sophia Ravat? Claire Inglis Caroline Stocker Katrina Read Sarah Gibbs I'm thinking this is true. Stacie Jayne Dunkley think Gracie Dunkley can beat that? See not much Hai Yan Huang !! Megan Foreman Katie Robson Kim King lol ! Marie-Anne Hollins made me think of you! Katherine Dey Selina Myers good luck! Steph Browning Kathryn Bower Our Evan. NJ Elder- x3 when they're 7. Now at six there are only 436!! Ryan Hobbs bet you can't wait! Usually - Are we there yet? Andrew Watton sounds about right! Keirsten , Finley Frew asks more than this? Keeley Weeley Appleton - this is why we’re so tired! Daz Vooght Erin Ahern 8 months to go!